Take flight with this dark and regal butterfly ring. This ring showcases a butterfly filled with various round single cut 1.20mm blue diamonds in prong settings. The wings are lifted on the corner edges bringing life to this butterfly. Very Pretty!! The total diamond weight is approximately 0.30ct. 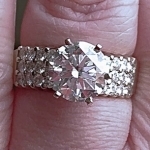 The ring measures 7/16"L x 3/16"W x 13/16"H. Gently worn pre-owned condition. Rhodium plated sterling silver. Thin rounded band but very durable and comfortable. Size 9. Easily resized by your local jeweler. Stamped 925 inside band.